The dynamic and ever-growing Internet of Things (IoT) has led to transformative business models and is radically impacting products and services of businesses. In this diversified landscape which boasts of multi-protocol and multiple connected devices, enterprises want to create compelling applications offering the highest levels of scalability and security. Xoriant helps facilitate this need by creating ubiquitous machine-to-machine and IoT business applications for use by both enterprises and their customers. In their client engagements, they have been able to address key challenges like data management issues, privacy and security concerns, standards and interoperable technologies within IoT application. Xoriant has leveraged its experience in M2M communications, cloud computing, data analytics, wireless and mobile gained through client engagements to create Xoriant IoT Application Accelerator which accelerates application development while also addressing several key challenges. 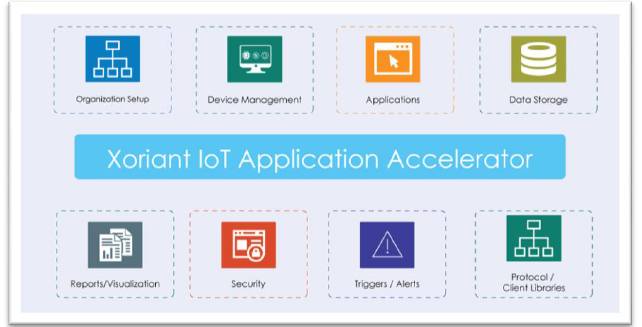 Xoriant IoT Application Accelerator (XIAA) provides a rich set of built-in functions to help you kick-start your IoT application development. The accelerator components have been designed, built and tested via IoT project implementations across various industries and consists of key building blocks that form a typical IoT application architecture. XIAA enables application scalability and security which allows you to quickly build and deliver custom IoT applications and integrate IoT data into your enterprise solutions. The diagram depicts different modules of the Xoriant IoT Application Accelerator. The accelerator provides device ready and technology agnostic functionality points seen recurring across connected applications. Data Storage Handles all data sent from multiple devices to the IoT platform, it will be logged in organization specific data space without any translation /adaptation of the data. Notifications Helps define triggers/alerts for device status, data usage and the corresponding communication channel. E.g. if a device is malfunctioning, alerts can be sent via email, SMS, and/or generic HTTP endpoint. Report / Visualizations Provides reports for device uptime/downtime, device status, firmware version, current location, device configuration logs, etc. Protocol / Client Libraries Provides libraries for various IoT protocols along with client libraries in mainstream programming languages. Security Helps secure your IoT communication between device and server side. Applications Enables bootstrapping your IoT application development with several starter applications. Leveraging the components of Xoriant IoT Application Accelerator, we helped our client to develop an IoT solution for real-time tracking and monitoring of shipments while in transit across seas. This also helped to identify if a ship has changed route and helped in effective operational planning. Developed a web based IoT application to collect and process multiple sensor data and create graphical views for monitoring energy consumption of client’ invertor products. This helps client in identifying energy consumption trends and any unconventional usage.